As the days become longer, many Coloradans are planning their outdoor adventures for the season. Our state is known for amazing views and sunny (yet unpredictable) weather. From camping trips to working on the car, everyone has a reason to go out and soak up the sunshine. If you are a homeowner in Fort Collins or the surrounding area, you may be considering a deck installation project to provide a quality space for your family to visit and relax in the fresh air. When investing in quality outdoor decking, it’s important to work with local experts to deliver the most bang for your buck. 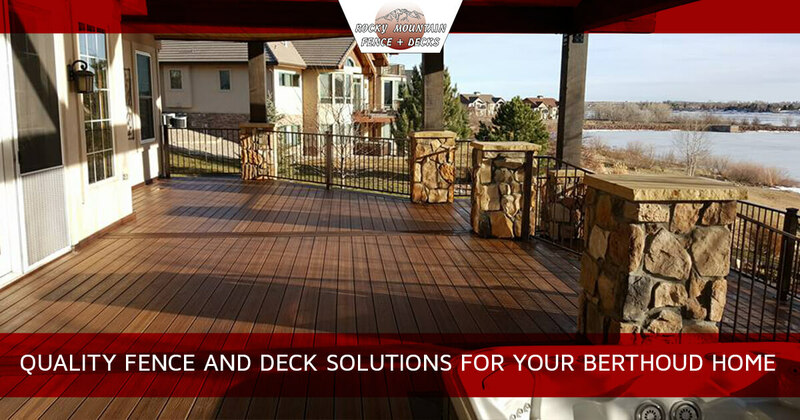 Rocky Mountain Fence & Decks is here to serve as your decking company in Larimer County, delivering unmatched services such as deck building, fence installations, and more. We’re committed to being your hometown experts, and our deck builders will work hard to earn your continued business. A major part of our success comes from our top-notch customer satisfaction approach that focuses on delivering the most value for the cost. Today, we’ll continue to discuss a few beneficial additions to enhance deck installation in Fort Collins. When done, be sure to reach out to our experts to receive a quote for your property! If you plan on entertaining on your new deck, it’s important to properly plan for the best use of your space. Our modern world relies heavily on technology for entertainment, making it necessary to plan ahead for your deck build. Many homeowners are happy to install wiring in their new outdoor living area, including the gear needed to charge your gear and keep it lit. One handy way to greatly enhance the fun of your deck is to splurge for a built-in sound system. When installed by professional deck contractors, you can expect your exterior sound system to be durable, out of the way, and ready for year-round use. Homeowners can elect to customize this tip however they want, whether they’re planning on a small space for entertainment or need multiple speakers for the best effect. As always, our professional decking company is here to help out! Lighting up your deck or outdoor living area is important for both the safety and convenience of your guests. Our Fort Collins deck builders can work with you to find the best lighting products for your new deck, creating a balanced display that helps to illuminate dark and dangerous spaces. These lights can range from lanterns on the posts to a chandelier over the dining area, if you have a pergola or roof system included in your deck installation plans. Homeowners also benefit from installing lights on their steps and walkways to illuminate safe passage to reduce the dangers of enjoying your space at night. One of the best ways to enhance the space of your home is to extend your interior facilities into the outdoors. Outdoor living spaces are quickly coming into high demand due to the value and enjoyment homeowners can gain from investing in professional deck installation services. When done correctly, you can transition from your kitchen to your outdoor living area seamlessly, making your new deck a valuable addition to the property. The most important thing to remember when planning your deck design is to build it to best match your family’s lifestyle. Some Fort Collins decks benefit from sunny greenhouses that yield delicious vegetables or vibrant flowers. Others have invested in options such as attached gazebos to increase the usable space in a clean and stylish manner. No matter what your budget is, it’s important to develop features that you will most enjoy throughout the year. Our deck builders have experience in a wide range of applications, from expanding storage space to custom deck additions such as hot tubs. No matter what you need your new deck for, be sure to spend enough time designing it for the best results. If you’re looking for a deck installation in the Fort Collins area, it’s important to work with a reputable group that focuses on honesty and integrity to deliver the best results on every job. Our decking company in Larimer County delivers the best outcomes to Front Range homes, from fence installations to pergolas and more. If you are considering a new deck installation to greet the sunny season, be sure to contact us for a quote today!